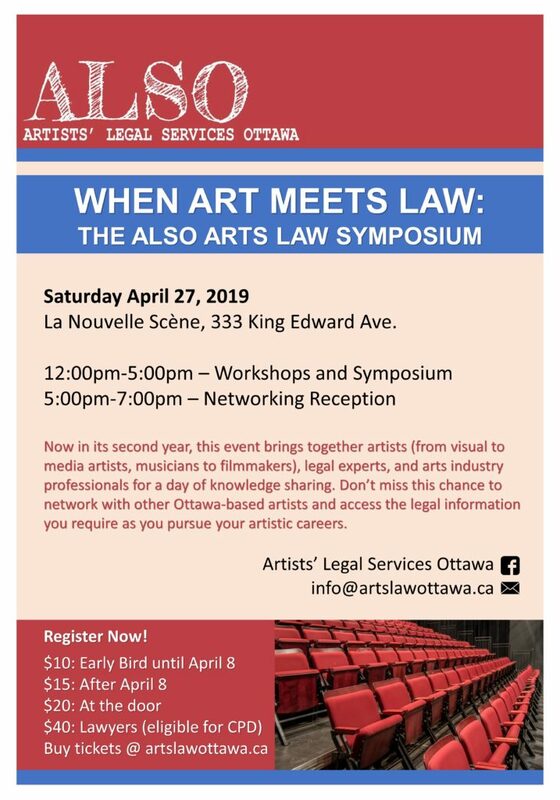 Now in its second year, the ALSO Arts Law Conference brings together artists, legal experts, and arts industry professionals for a day of knowledge sharing. Don’t miss this chance to network with Ottawa-region artists and the legal information they require to pursue their artistic careers. The 2019 Program is available now! ALSO is a not-for-profit organization established in 2012 and is dedicated to sharing legal information with artists in the National Capital Region to fill an access to justice need often overlooked for artists. The group is run completely by volunteer lawyers and artists. For the past 6 years, ALSO has hosted numerous educational panels annually on themes relating to artists’ legal rights and issues.